Yak Fisher contains over 40 pages of technical fishing articles, product and kayak reviews, hints and tips as well as our instructional kayak DIY articles. Yak Fisher articles cover subjects of interest to readers with all levels of yak fishing expertise, from the beginner to the expert. 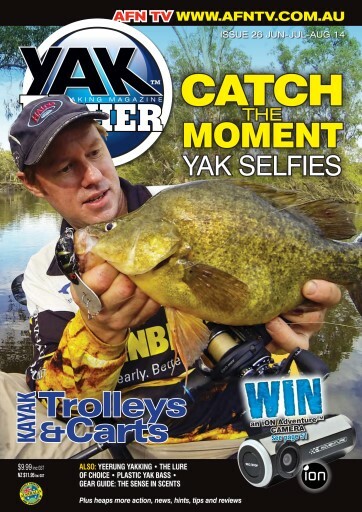 Yak Fisher is a technical magazine that kayak fishing enthusiasts have well and truly grasped as their own. We actively listen to requests you provide on the information you most want to get your hands on. Each magazine is strategically developed to give you the best balance of information you require to continue to enjoy your chosen pursuits in the best way possible. Issue #26 of Yak Fisher magazine – June, July, August 2014 has a great mix of kayak fishing articles on places ideal to fish this winter. Owen McPaul pulls out the soft plastics and goes in search of bass, Richard Linossi gives tips on picking the correct lure for different conditions and Jason Erlich shows you how to 'catch the moment' with waterproof cameras. Also included is a guide to kayak trolleys and fish scents, and a Yak Review of Old Town's Discovery Canoes. You'll receive 4 issues during a 1 year Yak Fisher magazine subscription. You'll receive 4 issues during a 1 year Yak Fisher magazine print subscription.